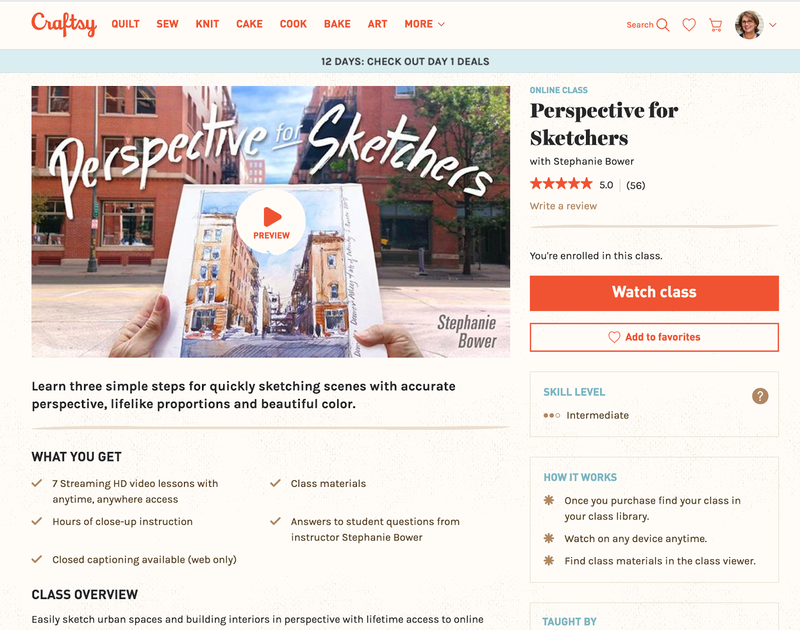 Drawing Perspectives: REAL Discount Codes for Craftsy Classes online! REAL Discount Codes for Craftsy Classes online! 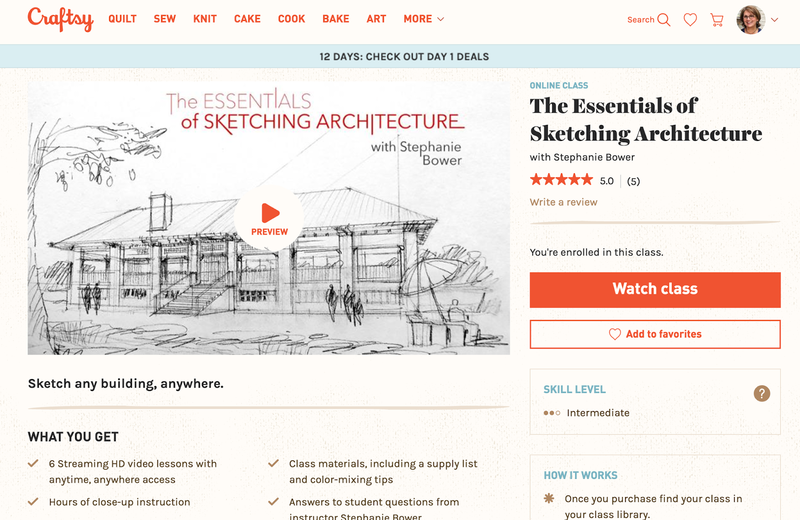 At long last, we have discount codes for my two online classes on Craftsy!!! Woo hoo! I invite you to use these codes for a 50% discount good through March 2, 2017. When you use these codes, it really helps support the instructors, like me! So, please use these links instead of going directly through the Craftsy website--thank you! The discount should come up automatically when you use these links. 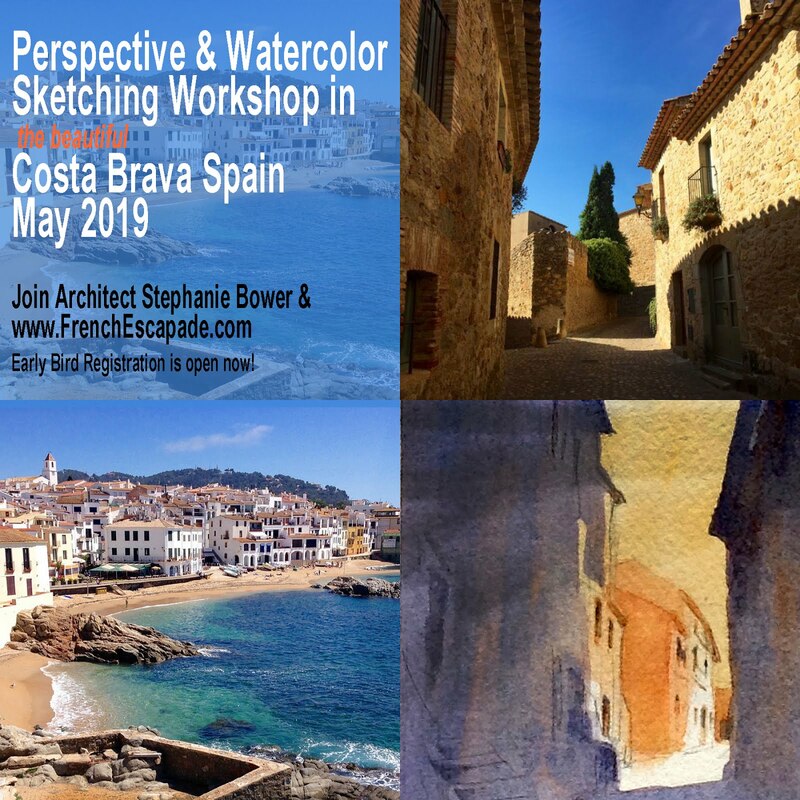 You can view a preview video of the classes and read reviews on Craftsy too--over 5000 participants world wide in "Perspective for Sketchers" and almost 2000 in the new "The Essentials of Sketching Architecture" class. Please join us! 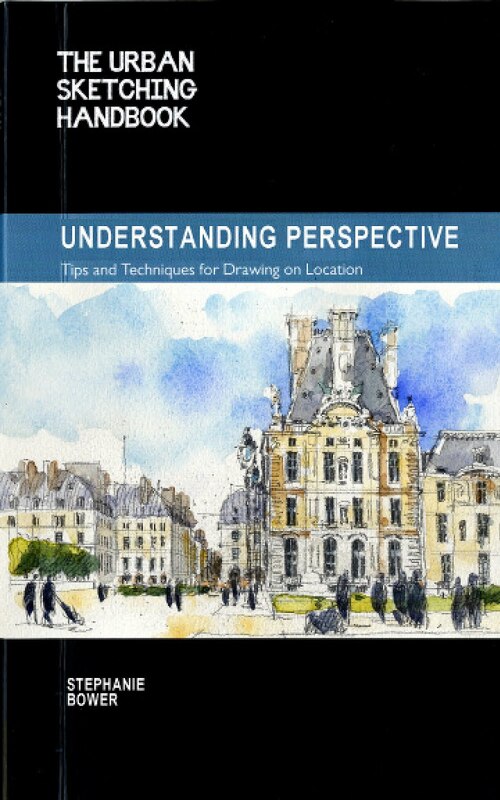 i discoverd stephanie bower through buying her book on perspective which was excellent. i then took her class on Craftsy. she is an amazing teacher, one of the very best that i've had. i've had several teachers, and being a teacher myself, i am very particular about teachers. she is very clear, breaks down the steps to learning perspective and techniques of sketching. Her feedback is very generous, i do believe she really enjoys teaching. She offers helpful suggestions but is also encouraging. Stephanie I have a couple of questions regarding people placement. I am enrolled in 2 Craftsy classes and recently purchased your handbook on Understanding Perspective. On page 67 in the handbook, you have 3 examples. Flat, no slope. Sloping up. And sloping down. Flat, no slope and all heads are on the eye level. Sloping up and the closest persons head is below the persons head in the background. And the furthest person appears taller than the eye level line (and below the VP). This doesn't make sense to me. Then sloping down, the persons head in the background figure is again above the eye level but below the VP. I hope you're still with me! Is there a 'rule of thumb" for sloping up and sloping down for people's heads OR are they scattered as in a birds eye view? THANK YOU! Love your Craftsy classes and book. Hi Peggy, well first, thank you for the classes and the book!! I am so happy you like them! The main eye level line, the one you really need to be concerned with, is your eye level...in all three images, the person on the right who is standing on the same ground as you is also at your eye level, so his head is on the eye level line. In the flat diagram, both the person on the right and the one in the distance are at your eye level, so no matter where they are, front or back, their head is on your eye level line. Then imagine you are looking up a hill...people standing on the hill will be higher than your eye level. Converse for looking down hill...people below you will be below your eye level. These diagrams are really intended to show how the vanishing points shift if something is sloping up (VP pops UP) or sloping down (VP goes DOWN). I hope this makes sense...and my gosh, but I am amazed and thrilled that you looked so closely at the diagram and are reading the book so carefully!!! Kudos to you, and thank you!!!!! Thank you Stephanie. Now I understand my confusion. I was visualizing the buildings as very tall, as in a cityscape. I was looking at the distant persons height and imagining the size of a door entrance is relation to the height of the person! I was connecting the vanishing lines to an imposed door height on the 'flat' and using it on the 'sloping up'. Thus the distant person appeared huge to me! Yicks! Please don't post this. I'm feeling pretty silly wasting your time. Thank you again! Hi Peggy, well, your reply posted automatically--however, please don't worry! This is in no way a waste of my time, in fact I LOVE LOVE LOVE that you are reading the book so carefully and asking questions, working hard to figure out how perspective works! Honestly, one labors over creating a book, it goes out to the world (which in itself is pretty amazing), but there is actually very little in the way of feedback. Do people even read the thing? Do they like it, find it useful? I really have no way of knowing unless the Peggy's of the world send me a question or comment, so THANK YOU!! hey stephanie I'm from india and i love your work and wanted to subscribe to your craftsy class but I'm unable to do so as my country is not listed in the craftsy payment info page and even paypal doesn't seem to accept. Is there any other way to access your classess? Thank you, Stephanie! I have nothing but complements for your "Perspective for Sketchers" course, which is the best explanation of the subject, bar none, with the possible exception of your book, which I haven't yet read. I have read many books and watched other online courses over the years and was never able to grasp the topic until now. What's more, it was a snap! In trying to learn perspective, I've always felt like a dunce and a failure, but you broke the topic into bite-sized pieces that made it so very easy. Your explanation and visuals are perfect, and you use the right amount of reinforcement to make the explanations stick without being boring or feeling repetitious. I cannot recommend your course highly enough to anyone who wants to learn perspective, particularly for anyone who, like me, has had difficulty understanding it. It takes special skill to take a difficult topic and make it this easy to comprehend. I commend you and am very grateful!